So, in my foodie's journey, recently one day, I thought to do something I've been thinking to do for a long time. There's a particular sweet that I have come across since I moved down to Delhi around 10 years back. It was particularly the taste of this gently sweet delicacy which traditionally comes from the royal land of Rajasthan that made it among my favourites. There's a peculiar thing about this delicacy. It's the availability of this sweet. This sweet is available during a month and a half around the festival of Rakshabandhan, that comes in the month of August. Anyhow, the subtle taste of the preparation fried in pure desi ghee dipped in sugar syrup, garnished with the slightly sweet tasting milk rabdi and sliced dry fruits is heavenly. A number of you might have by now guessed it. I am talking about Ghewar! The Rakshabandhan speciality. I have heard that having it hot is much more delicious. Though I have never been lucky enough to get my hands on it while it is hot, I do like the subtle and distinctive tastes of everything its made up of. So, I started wondering how to make it myself, so as to ensure its availability throughout the year, not depending upon the stores and the monsoon season to relish the delicacy. I hit the internet with the intention to find how to make it myself, and curiously enough to know what that spongy base is made up of. As it appeared, it was plain refined flour (maida) made into in a smooth easy flowing batter, that is to be fried in preferably hot ghee in a baseless vessel, made specially for this purpose placed in a frying pan with a flat base. I crammed through the recipe, and as I normally do, I missed some steps, some of them I missed were rather important ones, for that matter. I hopped on in the chef's apron, and set out to make delicious lip smacking ghewar. What came out of it was something disappointing for me in terms of what I supposedly set out preparing. Nevertheless, the stuff that went into it tasted awesome, except the milk rabdi I prepared. This turned out to be ghewar malpua instead of ghewar. Though I know there's malpua, and it's prepared more or less in the same way, with my mother doing it by mixing everything in the batter, including the sugar as well, instead of having a separate sugar syrup. I am calling it ghewar malpua because I set on to make it ghewar, following the entire recipe, but it turned out to be malpua which somehow had a little resemblance to ghewar. Here I go with the recipe, the one I followed. Take a look for what's below! Though, I guess you are not naive enough to know how to make sugar syrup, still for those who think they will do some goofup, I'll tell it here. Youhave to add the sugar in water and boil it over on the gas stove for some time, around 20 minutes ill be fine on medium flame, to get the proper consistency. We will be using this syrup to dip in the malpua we will be frying in the ghee. 3. And do I really need to tell you that you need a gas stove or a induction cooktop for frying? Different stages of Frying: The malpua now getting fried from one side. Bubbles are an indicator. Less bubbles means it's somewhat cooked. Different stages of Frying: The malpua now getting almost ready to be removed from the frying pan. Different stages of Frying: It can't wait anymore to take the holy dip in the sugar syrup. You can notice that the bubbles have almost all gone. Once your batter is ready, you need a frying pan, or a kadahi, whichever is available will do. I am not a hi-fi chef that I would recommend getting you a non stick frying pan, neither this post is a sponsored one for me to say that you should get XYZ brand non-stick cookware. Use whatever you find in your home. It's good to use a frying utensil with a heavy base. A kadahi with a round base will do good enough, as you won't need too much ghee to fry your ghewars. Ok, lots of terachings, lets get back to work. You have your kadahi ready on the stove with medium flame, pour some ghee in the kadahi and let it heat properly. After a while, with a pouring ladle, pour the batter in the center of the kadahi. Once the ghee is hot, if the batter has a good consistency, most of it will settle down inthe center with some of the batter floating over. Fry it till it becomes golden brown. If the thin sides are turning dark, you need to lower the flame of your gas stove. Once done, take it out, leave it in the kadahi out of the ghee to let the extra ghee come out. Then dip the malpua in hot sugar syrup, and take it our immediately. Serve hot by garnishing with either milk rabdi and sliced fruits like almonds an/or pistachios, or whatever you have available in your home. It still tastes great without any garnishing, so, it isn't really important. Dipped in the sugar syrup. Got the sweetness! Sometime back, I told you about an ongoing project at my home, a plan to install a few solar panels at the rooftop of my house. The plan was conceived around more than five years ago, and now it appears to have become a Five-Year Plan, considering the long term idea, planning and research in executing it on the ground. Appears as if I have finally reached a stage where I could try working on executing the plan, finally. Since I am from Humanities background (did my Graduation and Post Grad in Geography, since I was too fond of the subject). Studying the Earth and its atmosphere, while in my graduation days, I realized that the immense amount of energy the sun gives us is getting wasted. Did you know that the amount of sun's energy that reaches the earth's surface is around 1000 Watts per square meter. Yes, 1 kW per square meter. That is at any given point of time, if the sky is clear, the earth's surface receives 1 kilowatts of energy on a spot 1 metre long by 1 metre wide. We are getting so much of energy, for free, and at close to zero cost, one which is relatively much safer and cleaner than our conventional sources of energy (electricity), and we still have so less that we face powercuts and load shedding on a regular basis, not to mention the many parts of the country which still have no access to electricity? I have almost no theoretical knowledge of electronics, and anything related to engineering. So, I had to do indulge into a lot of research before even thinking about the type of system I need to have. Moreover, since I am not planning to get any expert professional help, as far as design and implementation of this project is concerned, except some help in working on the metallic parts, tracker, frames and such, which, I can't work on myself without having the required tools.Though, over time I have gathered a lot of the tools, but welding cutting and grinding machines are something I don't see a need for, not to say they will be way too expensive. There were a lot of hindrances, biggest being the costs involved. Initial estimates into the cost of the project had me really worried. The costs were a bit too much for me to get an approval for it. The initial estimates suggested that the project would cost upwards of Rs. 1 Lakh. So, I dropped the plan for a while, to proceed with researching on the project, what all would I need, and how things would go on. Above all the hindrances, the hardest was to get my mother onboard, as she is the only person who could derail the plan. Afterall, she cares for our futures, and for something she feels wrong or unnecessary, she won't ever give an approval for. So, everything aside, research started. I dived deep into the internet in search of the best possible technologies that could help me minimize the project costs and achieve the results I ever wanted. It was during this search over the internet that I found internet to be a very useful things. Although, here in India, which is still considered a third world country, we do not have all the facilities. However the research paid off. In the meantime, I worked on making an environment suitable enough for me to get the approval from other members. I easily got my brother on board, and getting my father onboard too wasn't much of an issue. The real issue was with my mother, since all she saw and cared for was the costs involved. Over time, both me and my brother looked for options, and he was the one who came up with the idea of a programmable microcontroller board that could be used in the project. We decided that in order to cut down the costs, and to have a decent small start, we would design an upscalable system, that will initially be started with a small capacity and once it starts working properly, we will gradually upscale it to increase its capacity. A lot of the work was done by my brother, who is better than me in a lot of things, including his knowledge of electronics and circuits, programming. He wrote the basic code for the microcontroller. We decided on the basic hardware we needed, electronics, including the microcontroller platform called Arduino. We decided that we will build an autonomous system that would need the minimum human interference, and would work at its optimum capacity. The plan was to build a Solar Power System for usage at my home. The system would work in tandem with the Utility power (AC Mains) that we get from the power distribution company. Such a system is often called a Hybrid System. In order to increase the efficiency, the system was planned to be a Sun tracked, one which would actively monitor the location of the sun and would align the panels in the best position possible to maximize the outputs from the panel, irrespective of the time of the day and the location of the sun. We also decided that since Sub changes its position both, from morning to evening and also seasonally, both technically called Solar Zenith and Solar Azimuth respectively. Wait a minute, do I really need to write the technical stuff here? Really? I guess no. Okay, I'll not go in much detail. To build a solar tracked system, we had to work up on the mechanism to track the sun. Grossly mechanical and electronic stuff, much of it out of our knowledge. We resorted to the internet again, and found more than a dozen of ideas to go with. Finally we settled down with one we found on instructable.com. Collected all the required stuff (Had to make a few necessary changes because of the cost restraint and the availability of the components, which changed the entire project to be again done from scratch) So, finally, last year, we worked up and built a small prototype of the tracker. A Single Axis one, just to check what's happening in reality. And the result? Here it is for you to check it out. Though the thing is pretty much a discreet one, with the use of a thermocole panel to mimic the solar panel just for tracking the tracker, hardware, electronics and the software. As visible in the video, the tracker still had some random jitters when tracking the light. And since this test was done in a more or less controlled environment, we still had a long way to go. Also, implementing the dual axis tracking was to introduce some more complications to the plan. The ideas we found over the internet were mostly concentrating on small models, suitable enough to be used in laboratories or as projects by some students, but no one had tried doing the same on a large scale (in a real life scenario) as we planned to. The components became bigger, and expensive and the implementation, more complex. The result? The way the smaller models worked in these illustrations wasn't possible for us to replicate, or it'd be better if I say, we had to do this in real life, so, needed much more robustness and reliability from the tracker. So, more time went into the research and development of ideas to do this again. Later the same year, we built a second prototype (the first one of the Dual Axis tracking type), this time, since it was again a prototype, we just did some workarounds to test the functonality of the hardware, electronics and the software. What turned out had us overjoyed and even more optimistic about the project. It was working, yes it was (but again, in controlled environment, with artificial light sources, which we could control) This one again failed miserably as we moved out to test in the real life situation, out in the sun, where it was receiving light from all around, and the tracker just went crazy unable to really understand where to focus. Here's a video of the second prototype we built and tested in a controlled environment. We again delayed the plan needing time to checkout the findings from the real life test and also considering the fact that we had to build a real life working prototype, which would be a scale model of the real tracker we were planning to build. So, we set on the mission to plan and build a design for the solar tracker, one which was capable of moving both horizontally, and vertically. A large part of last year and another bigger chunk of this year we spend on planning, designing and junking different designs. Our concerns were the space, which is quite less, as we didn't want to clutter the space we had on the rooftop by installing some expensive pieces of hardware, sitting in place, doing its work, but hampering ours. By the way, if you don't already know, I have a rooftop container garden, which already covers a big portion of the roof, so, I can't afford to reserve any more space. Actually, in reality, I won't be allowed to. I guess this is already a really big post. I think I should cut back contents and do follow-up post with the rest part of the project. Moreover, since, we are now actively working on the project (when we get some time on sundays), so there will be a lot to share with you guys. So, I need to wrap up for now. See you in the next post, maybe, with a third video of the latest prototype, doing what and how it was intended to. Being a working professional, at times, it becomes pretty hard keeping yourself in shape, moreso when your work involves working on the computer nine hours a day. Just like a number of other working people, in my age group, the same is happening with me. Working on for a little over five years now has taken a toll on my health, not that I have become unhealthy, but, a person's weight and the overall appearance is said to be an indicator of his overall health. And that is the front that I am unhealthy at. My weight has been growing steadily and this is something I need to be bothered a lot about. So, I decided to give a try to reducing my weight, and the visible belly, as I don't want it to develop as a pot belly. My line of action included a brisk walk early in the morning, before I leave for office. Given my office timings, since I need to be in office from 9 am to 6 pm, six days a week, adding around 3 hours of travel time for both sides, there's hardly any time left to do anything more, including gymming. 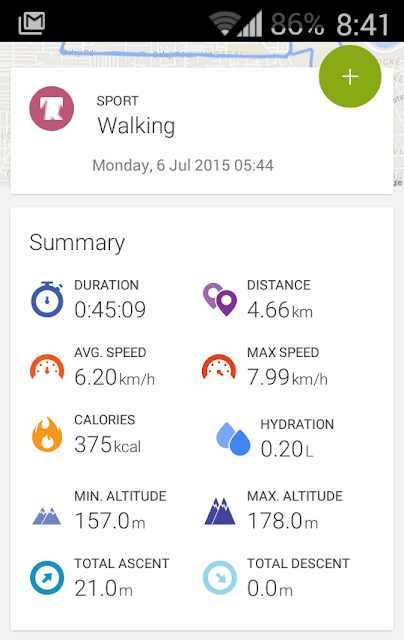 The morning walk regime started, to keep a track of my workout, I am using a phone based app called Endomondo, which helps me track the number of kilometers I have walked with the help of GPS tracking, and a number of other useful features like approximate calories burnt in a workout, pace and speed at which I walked, average time taken per lap (which breaks up the entire course of workout in laps of 1 km each). Screenshot of the application showing one of my workouts history. Beyond this simple workout, it is advised that one follows a controlled dieting regime too for an effective weight management. Experts advice that people should not over do this with the help of crash diets, skipping meals and such. One such helpful way to help you reduce weight faster and more effectively is reducing your sugar intake. It is advised that one can replace refined sugar they take in in food and drinks with honey, a better and natural alternative that is sweet but is not harmful like sugar. While crash diets appear to be a better alternative, in the long run, this is not a good alternative, since crash dieting includes a drastic reduction in calorie intake, and at times people skip entire meals, which can make them feel unwell, and does affect our long term health as well. Moreover, crash diets are not known to help you maintain the weight for a longer term. That's why a gradual weight loss regime, which involves a balanced, well thought out diet, regular physical workouts is something recommended. So, I was talking about Sugar intake. It is believed that more than fat, sugar plays a much bigger role in increasing your weight. So, a proper balanced diet targeted at weight loss usually does away with sugar intake, and as a substitute honey is used. This is called Honey Diet. A dieting regime where the use of refined sugar has been largely or completely replaced by alternatives like Honey. Weight lost in a proper planned and balanced way goes a long way keeping the weight you managed to reduce, and doesn't have any negative impact on your health since you are not skipping any meals or are not taking any drastic steps to reduce weight. Well, I am trying to inculcate healthy eating habits, and trying to continue my physical workout regime, let's see and hope that I be successful, and don't reach the pot belly stage. Back in the days when I was still a kid, still in my years of learning, I happened to be a notorious one. Yes a really notorious one for that matter. With a high temperament, easy fight picker, and one who always used to feature with a bandage on some part of the body. As I might have already told in one of my earlier blogposts, if not this blog, then, my other blog, Metro Greens: Journey of a Plant Lover, that I belong to a defence background. My father was in Army, so, a good amount of my days of growing up got spent inside the Army Cantonment. Though, it was never the same place. As is a tradition in the Defence Forces, soldiers and officers alike, have to move out from one place of duty to another, normally called Posting in the Army. So, I happened to be a rather explorer kind of a thing. More than anything, my unwillingness to stay indoors even in extreme summer months of Jodhpur, was something that invited me trouble at a number of times, and mischiefs at other times. As evident from one thing peculiar to the Army, a soldier is expected to be self sufficient to see himself through in any situation. No, it's not that the Army leaves the soldiers at their own to take care of themselves, but, being in the Army, you have to do all sorts of works being a Jawan (all the people below Officer Ranks). So, you could see people, and your father among them, cutting and chopping down grass in the Married Acommodation. At times, these people could be seen painting and decorating the surroundings of their offices and even the quarters. The same was visible in the Mess too, and at a number of other places. Something that displays the attitude to be self dependent and complete in oneself. So, my learning days had to be affected by this. Today, I proudly claim myself to be someone who can cook good enough, and a variety of things. Much of the credit for this goes to my mother, who, used to seek me in the kitchen when she's cooking something. That eventually garnered my interest in knowing what is what and what quantity of what spices one needs to put in some recipe. The same happened with a number of other things, like my hobby of gardening, which too have its roots in both my parents, since, the quarters allocated to us used to have aplenty space both in front and back of them, so, kitchen gardens were quite prevalent. So, whenever either of my parent worked in the garden, we were expected to be there to see and learn and help. I wasn't a very good kid when it came to being a student, not being a very bright one, though, no one ever had any complaints regarding my behaviour, but academics, in those days used to be the sole indicator of how good a student you are. This was one place which dragged me away from my father and closer to my mother, since he used to be the one who used to make me study and do Maths! No, it's not that my mother didn't pay attention to that aspect, but, being growing up kids, and moreso, when your mother is not that much educated, we used to be what is called SMARTY PANTS. Easily getting ourselves out of situations in front of mothers. But with fathers, it used to be a different ball game. For me, it used to be hard trying to act infront of my father. But then, it was my father who would send me to bed at 9 in the night and wake me up at 5, making me sit in his lap and he himself covered in in the blanket in the winter season and made me remember lessons. Ah! Those were the days! Growing up, I understood a few things, one including the fact that it is easier to get things done with your kids when you befriend them instead of being authoritative. Authoritarian parents, as we used to see, usually happened to have two kinds of kids. Ones who would become a machine, devoid of any emotions, waiting for the command from the parent to act, and second, the ones who would act like the ideal son or daughter in front of their parents, but at the hindsight, be the worst mischief mongers. So, this was one teaching that I got, among a lot others from my parents. I hope that this teaching will go a long way with me in my life to come up. Buddy Parenting is something that every person should try to inculcate in themselves as a parent, and also teach the same to their kids so that they learn it right from the beginning.